LUSAKA, May 30 2016 (IPS) - “It is unacceptable that 138 years after Thomas Edison developed the light bulb, hundreds of millions of people cannot have access to electricity to simply light up the bulb in Africa,” says Africa Development Bank (AfDB) Group President, Akinwumi Adesina, mourning the gloomy statistics showing that over 645 million people in Africa lack access to electricity, while over 700 million are without clean energy for cooking. Adesina attributes Africa’s poverty and the perennial migration of youths to Europe in search of a good life, to lack of energy. “Even insects run from the dark to where there is light. Our youths are running away, hundreds of them drowning but the future of African’s youth does not lie at the bottom of the Mediterranean Sea,” he declared during the official opening of the just ended 51st AfDB annual meetings held in Lusaka, from 23-27 May under the theme, ‘Energy and Climate Change’. It is for this reason that top on the list of the bank’s strategies for all—referred to as the High fives (5s), is Light Up and Power Africa, with the goal of achieving universal access to energy for Africa within ten years through expansion of grid power by 160 gigawatts to connect 130 million people, and 75 million people to off-grid systems. “Africa is simply tired of being in the dark,” said Adesina, outlining AfDB’s strategy to achieve universal access to energy which he believes, would unlock Africa’s potential to feed itself, achieve industrialisation, integration and ultimately improve the quality of life for the people. However, ambition alone is not enough—it requires a realistic roadmap. And for the bank, the plan is to increase investment into the energy sector. “To deliver on the New Deal on Energy for Africa, the African Development Bank will invest $12 billion in the energy sector over the next five years,” he said, adding that, with this investment, the bank expects to leverage $45-50 billion. But with the 2015 Paris climate agreement centred on a transition to renewable energy, Africa may have to re-think its strategies on how to achieve its ambitious dream. And this was one key question that divided opinion at the 2016 AfDB annual meetings—Should Africa lead the way on Green growth or follow a carbon intensive path that the developed countries took to achieve industrialisation? Former President of Nigeria, Olusegun Obasanjo argued for Africa’s right to do so. “We in Africa must use what we have to get what we need. The West used coal to develop and I think we should also be allowed to pollute a bit and then, we will all join in cleaning up,” said Obasanjo during a panel discussion on Africa’s New Deal on Energy, one of the bank’s initiatives launched during the annual meetings. While Obasanjo’s line of thought seemed out of place considering the world’s renewable energy push, there was a sense of support for the continent’s right to develop as it pleases, especially that big polluters are seemingly elusive on financial support and emission cuts. 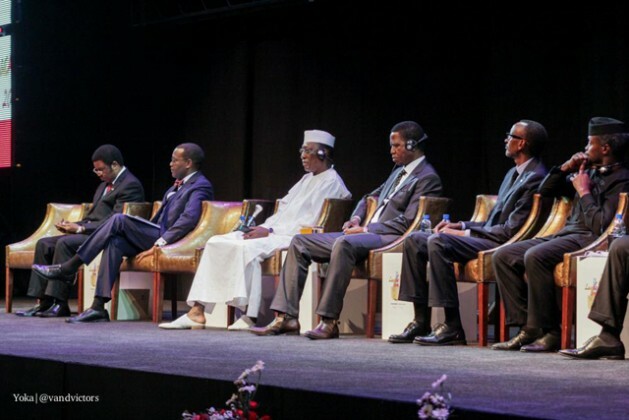 “We first have to get access to energy for us to know which one is clean and which one is dirty,” said Chadian President, Idris Derby, the current African Union Chairman, before the host President, Edgar Lungu summarised Africa’s dilemma. “It is always challenging to make a choice when you don’t have what to choose from…while we need to provide universal access to energy, climate change hinders our efforts, as some approaches are considered dirty,” said Lungu, highlighting his own country’s energy challenges emanating from poor rainfall in two consecutive seasons leading to low water levels for electricity generation at its main hydro power stations. Kenya’s Uhuru Kenyatta, Rwanda’s Paul Kagame and Nigeria’s Vice President, Yemi Osinbajo, were more concerned as to whether renewable energy is a realistic option in relation to the industrialisation agenda on the continent. “For us, we think renewable energy and climate change are serious but development of our people is a priority. Africa’s situation is unique, for example, we have been talking about industry here which requires base load power and this might require countries to put up hundreds of hectares of solar plants to achieve the needed power,” said Osinbajo, whose sentiments seemed to sum up those of Paul Kagame and Uhuru Kenyatta as expressed during a televised panel discussion. The underlying tone of African leaders in these discussions pointed to inconsistent flow of climate finance and technology transfer—a subject of debate at the core of the continent’s development, in relation to climate change. Climate change is real and it is unanimously agreed by both the North and the South that Africa is at the receiving end. This therefore entails climate justice through finance for the continent which has been short changed by climate change. The argument is that Africa must be supported financially to adapt to negative effects of climate change ravaging its people, but at the same time play a key role in mitigation efforts. However, the much debated climate finance has not been forthcoming. “Very little money is flowing into adaptation and the bank is concerned with this trend…wants to see more resources also being channeled to adaptation as the case is with mitigation where a huge chunk of resources is being invested,” observes Kurt Lonsway, the AfDB Manager of the Environment and Climate Change division. The inconsistent flow of financial resources, coupled with lukewarm emission cut commitments by the developed world, could be the cause for African leaders’ defying tone to take a lead on renewable energy despite being fully in support of the Paris climate deal. 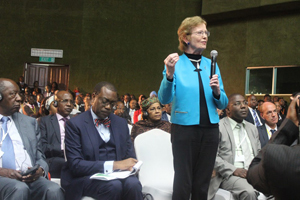 Mary Robinson making a point during a round table discussion of African Presidents. And former President of Ireland, Mary Robinson is alive to this state of affairs. However, she wants African leaders to use their collective voice to demand for climate justice. “Climate finance is no longer about aid to Africa but the means by which to serve the world from catastrophic climate change. I therefore plead with you, African leaders to use your collective voice to get what you want,” stressed the former Irish President who now heads the Mary Robinson Foundation for Climate Justice. But former United Nations Secretary General, Kofi Annan’s concern is African leaders’ political will. “The transformation we seek also requires decisive action on the part of Africa’s leaders in reforming inefficient, inequitable and often corrupt utilities that have failed to provide firms with a reliable power supply and people with access to electricity,” said the former top UN diplomat, who now chairs the Africa Progress Panel.